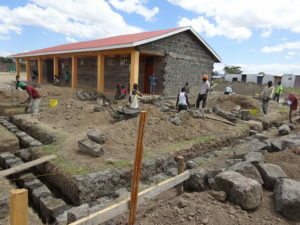 The next phase of the school construction has begun – Leben und Lernen in Kenia e. V.
Leben und Lernen in Kenia e. V.
We have begun building the next classroom. Six classrooms and our school kitchen have already been built within the past three years. The present construction phase consists of a classroom and two staff rooms with a restroom. We expect the construction to be completed by the end of February. The new classroom will be used as a day care classroom for children between the ages of three and four until the actual kindergarten is built. The last construction phase of our elementary school will be started as soon as we have sufficient funds available. You can find out how to support our construction at http://llk-selb.de/your-help/school-construction/?lang=en on our website.